Bulgarian visas will soon be available in 15 Chinese cities, said Deputy Prime Minister and Minister of Foreign Affairs Ekaterina Zaharieva during a meeting with the chairman of the Bulgarian-Chinese Chamber of Commerce and Industry – Lachezar Dinev. Currently, visas for Bulgaria are only available in the capital of Beijing and Shanghai. 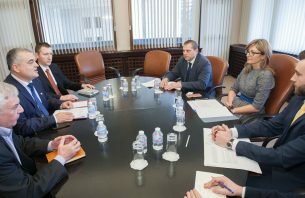 “Cultural diplomacy, tourism and especially education are among the activities whose development is a major priority of our ministry,” Minister Zaharieva underline and added that the efforts undertaken by the ministry will make a significant contribution to the knowledge of our country by Chinese tourists, students and businessmen. The cities in which Bulgarian visas will be possible applay in the near future are Guangzhou, Jinan, Kunming, Nanjing, Beijing, Xian, Wuhan, Fuzhou, Hangzhou, Changsha, Chongqing, Chengdu, Shanghai, Shenzhen and Shunyan. Ekaterina Zaharieva also underlined the importance of Bulgaria and partners such as the BCCCI to work to raise China’s visibility of Bulgarian higher education. Keypoint of discussion was Tourism. This Year Bulgarian-Chinese Chamber of Commerce and Industry will organise the only one tourism exibition for Bulgarian Travel Business in China this is Beijing international travel expo. Mr. Latchezar Dinev also discussed the challenges and opportunities facing businesses in both countries.